Viking is releasing an amazing new top-of-the-line machine, the DESIGNER EPIC™, in October! This is the first and only machine available on the market with an interactive tablet-like screen! This allows for incredible customization and detail made specifically for the particular and enthusiastic sewer. 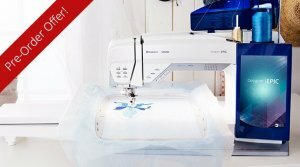 As a result, DESIGNER EPIC™ sewing and embroidery machine enables you to express your own creativity and achieve expert-level results with ease. Pre-order yours today and be among the first to experience the DESIGNER EPIC™ machine difference.